The Brazilian state of Bahia is where we are today, and it has enthralled our senses with its pretty beaches, vastly varying topography and colonial architectures. But what we were especially thrilled to come across is the uniquely stylish makeover of this once drab and mismatched living room in Itapetinga. Loaded with unbecoming colours, bulky and dated furniture and an unimpressive layout, the living room was previously an ordinary space with nothing to inspire. Until, the architects at Cardoso Chouza Arquitetos stepped in with their talent and creativity to render magic. 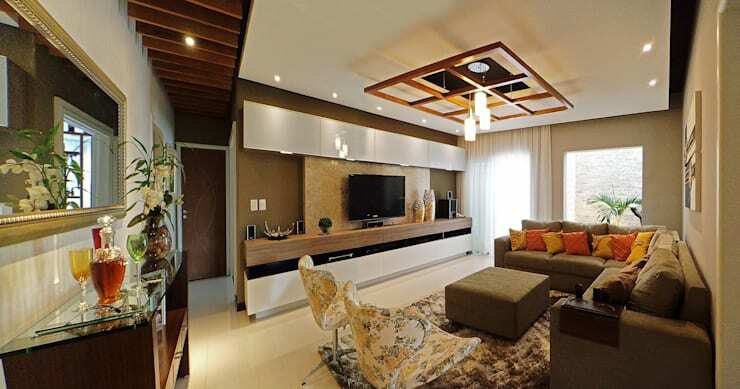 The dramatically revamped living area now sparkles with gleaming and sleek surfaces, innovative designs, sophisticated hues, and vibrant but tasteful touches. The living room was a picture of chaos even though there was no visible mess. That’s because of the bulky wooden cabinet which was visually jarring against this dull green room. 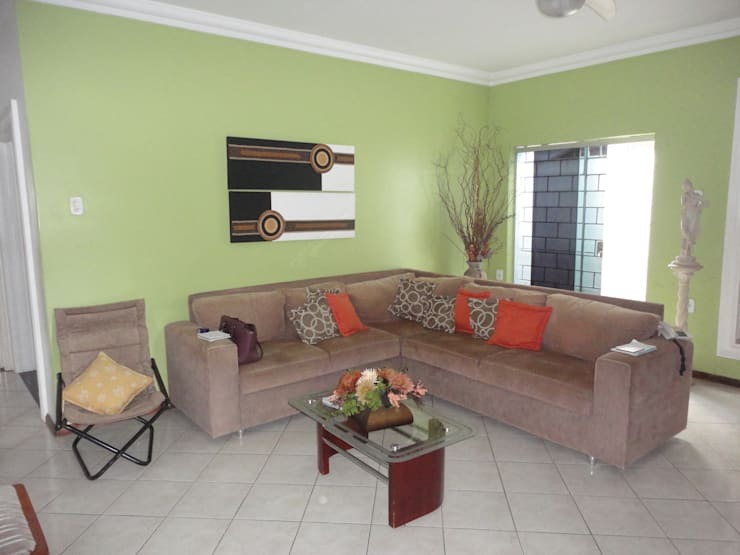 The beige couch and the too small coffee table did not match the surroundings at all, while the patterned and orange cushions looked completely out of place. The stylish new environs of this space are all thanks to the challenge that the architects undertook. Not only have they rescued the living area from design disaster, but they have also restored the potential that its corners have. The sandy brown sectional is a trendy piece that has been given a vibrant touch thanks to the cushions on it. At the same time, the slim panels for the entertainment unit bring in a play of neutral shades with a hint of glossy under the beautiful recessed lights. On the left side, a long mirror and end table decked with flowers and vases add to the aesthetic appeal of the room. The dull vibe in the room was so overpowering that it drowned all its scope and potential, while the layout did not exploit the available space properly. The architects have changed the entire perspective of the space by giving it a smarter layout that shows off the elongated space and its various corners. What we especially liked is the abstract artwork which subtly matches the wooden trellis and lighting suspended from the ceiling, and gives a visual lift to the neutral colours of the rest of the room. 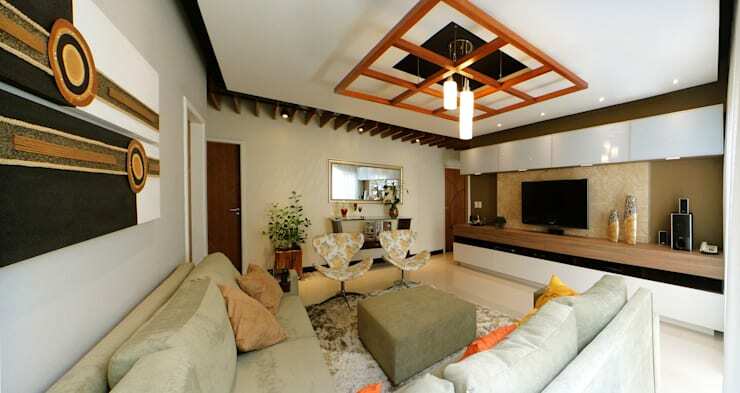 The periphery of the ceiling is defined by slim wooden beams which make for a stylish yet warm look. The large ottoman has replaced the odd coffee table, and sits on a plush rug which offers additional comfort. We also love the floral patterns on the upholstery of the trendy chairs in front of the mirror and sideboard. The entertainment unit gets a stunning and modern makeover that is neutral, sophisticated and stands out with a wonderful play of layers. 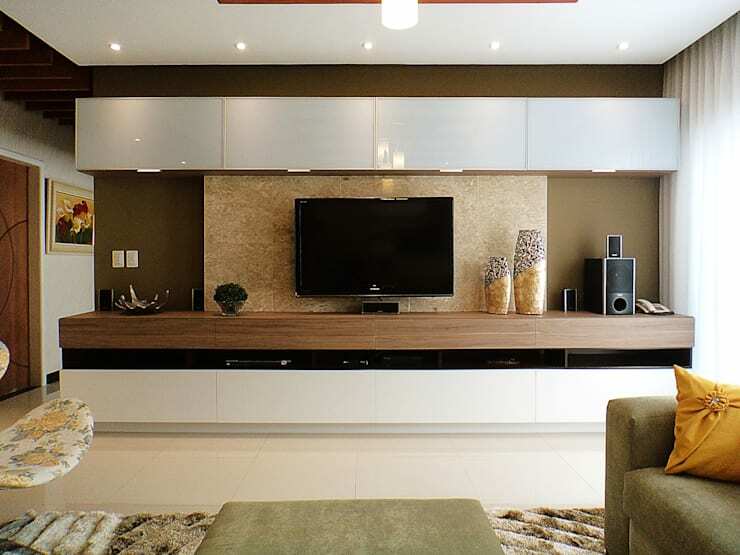 Pristine silvery white cabinets, strips of wood, a grey and olive wall, and a gleaming golden TV panel make the entire space trendy. The golden vases add a hint of glamour to this entertainment nook. 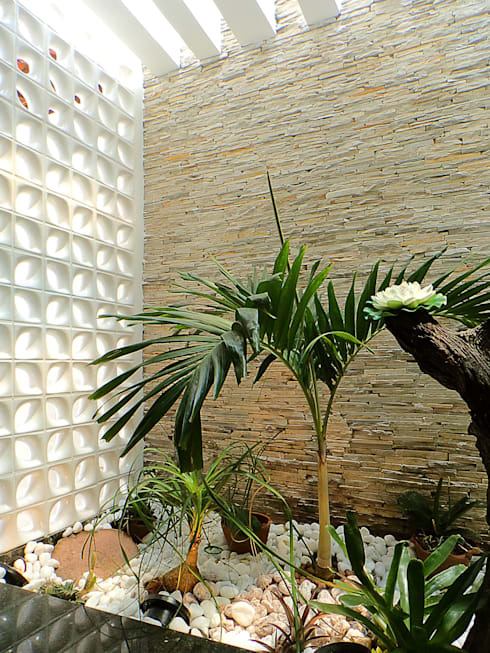 A small courtyard of greenery with stone pebbles and latticed and stone walls accompany the stylish living room for a calming and eco-friendly effect. The lattice and the spaced beams on the ceiling allow sunlight and fresh air to enter the courtyard plentifully. 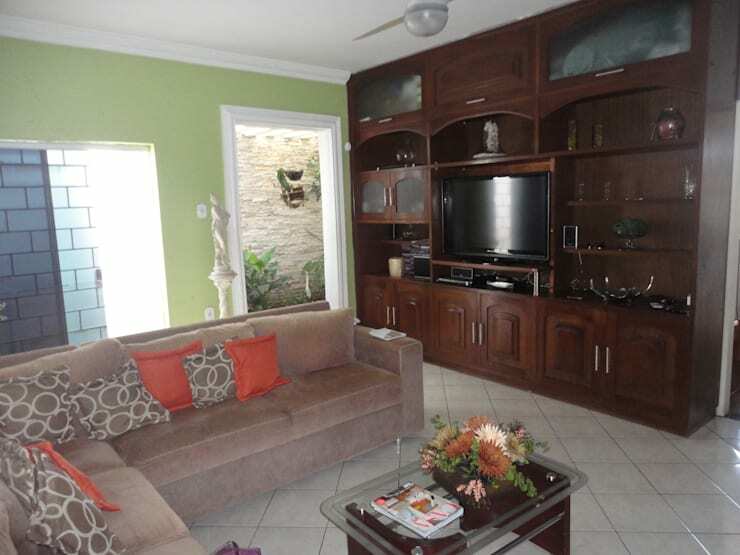 The once boring and uninviting living room is now a haven for leisure and entertainment amidst modern designs, elegant colours and modish decorative accents. Check out another before and after story for more ideas - The Refreshing Makeover of a Dreary Apartment.